Our 450 ml Single Wall Cup is ideal for serving cold drinks. Plus, paired with our promotional sleeves, the 450 ml Single Wall Cup’s suitable for hot beverages too. Perfect active advertising that’s different and fun! 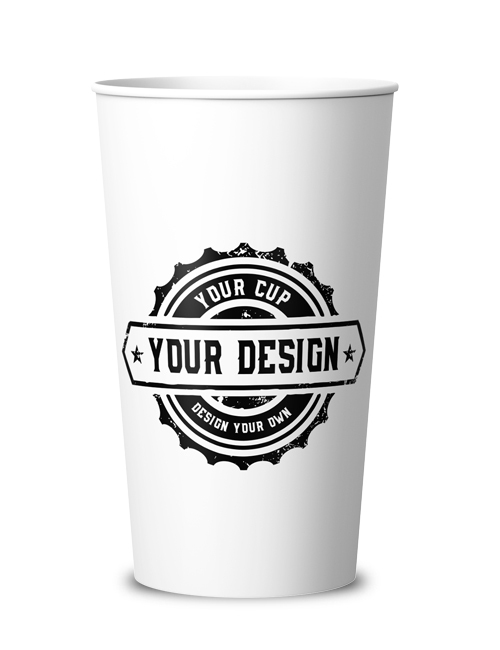 By highlighting your logo or marketing message, this personalised paper cup enhances your business. The Single Wall Cup includes a very high-end quality board. It’s great for serving all kinds of drinks at any event or conference and for general use in restaurants, businesses, cafes, and shops. Impress your guests and customers with this custom printed cup. This cup transports your brand image in the most tasteful way. The Single Wall Cup’s rigid 310 gm boxboard contributes to the printed paper cup’s quality. Our printing process relies on full colour or process inks – both completely food safe and odourless. And by using only the highest resolution, CupPrint makes the images on your personalised paper cup appear professional and flawless – sending a confident branding message. Depending on your individual business needs, you can buy the Single Wall Cups in orders ranging from 1,000 units up to 250,000 units. Guaranteed speedy service. Your personalised CupPrint paper cups will be delivered to you within 14 working days – no matter the size of your order! Our team is dedicated to serving the one-of-a-kind and individual needs of our customers. For your individual Single Wall Cup 16 oz design we provide you here our rectangular template as PDF for download.